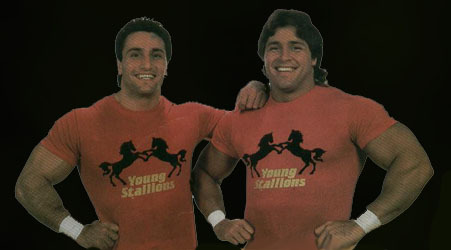 - WWF Saturday Night's Main Event #12 (September 23, '87) = The Young Stallions (Roma & Jim Powers) lost to the WWF Tag Champs, the Hart Foundation. - WWF Survivor Series '87 (November 26) = The Young Stallions, Strike Force, the Rougeau Brothers, the Killer Bees & the British Bulldogs fought in an "Elimination" Match against Demolition, the Hart Foundation, the Russians, the Islanders & Dino Bravo & Greg Valentine. The Young Stallions & the Killer Bees 'survived'. 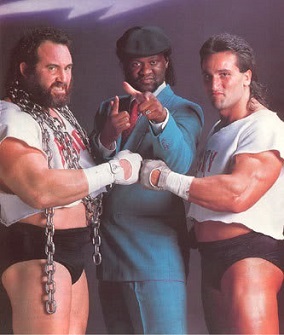 - WWF Royal Rumble '88 (January 24) = The Young Stallions lost a "Three Falls" Match to the Islanders. - WWF Wrestlemania IV (March 27, '88) = Roma competed in a "Battle Royal", which was won by Bad News Brown. 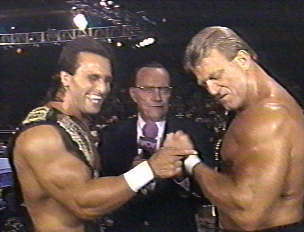 - WWF Saturday Night's Main Event #18 (November 16, '88) = The Young Stallions fell to the Rougeau Brothers. - WWF Survivor Series '88 (November 24) = The Young Stallions, the Powers of Pain, the Hart Foundation, the Rockers & the British Bulldogs fought in an "Elimination" Match against Demolition, the Bolsheviks, the Fabulous Rougeau Brothers, the Conquistadors & the Brain Busters. The Stallions were eliminated by the Bolsheviks. The Powers of Pain were the "survivors". - WWF London Arena (October 10, '89) = Roma was pinned by the Brooklyn Brawler. 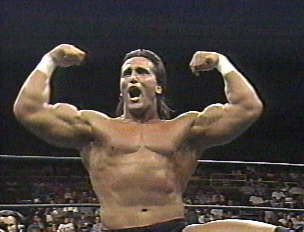 - WWF Royal Rumble '90 (January 21) = In a dark match, Roma took down the Brooklyn Brawler. - WWF Wrestlemania VI (April 1, '90) = In a dark match, Roma defeated the Brooklyn Brawler. - WWF Summerslam '90 (August 27) = Power & Glory (Roma & Hercules) won, via countout, over the Rockers. - WWF Survivor Series '90 (November 22) = Power & Glory, Rick Martel & the Warlord fought in an "Elimination" Match against Jake Roberts, Jimmy Snuka & the Rockers. Roma's entire team 'survived'. Later on, Power & Glory, Martel, the Warlord & Ted DiBiase fought in the "Survivors' Elimination" Match against Hulk Hogan, Tito Santana & the Ultimate Warrior. Roma was eliminated by Hogan, who 'survived' along with the Warrior. - WWF Royal Rumble '91 (January 19) = Roma competed in the Royal Rumble, which was won by Hulk Hogan. - WWF Wrestlemania VII (March 24, '91) = Power & Glory were beaten by the Legion of Doom. - WWF Saturday Night's Main Event #29 (April 15, '91) = Roma competed in a "Battle Royal", which was won by Mr. Perfect. - SWS Sumo Hall (June 7, '91) = Power & Glory were taken down by the Rockers. - WWF Summerslam '91 (August 26) = Power & Glory & the Warlord fell to Ricky Steamboat, the British Bulldog & the Texas Tornado. - WWF at Royal Albert Hall (October 3, '91) = Power & Glory lost to the WWF Tag Champs, the Legion of Doom. Later on, Roma competed in a "Battle Royal", which was won by the British Bulldog. - WCW Beach Blast '93 (July 18) = Roma & Arn Anderson were beaten by the WCW Tag-Team Champs, Brian Pillman & Steve Austin. - WCW Clash of the Champions XXIV (August 18, '93) = Roma & Arn Anderson won the WCW Tag-Team Titles from Steve Austin & Steven Regal. - WCW Fall Brawl '93 (September 19) = Roma & Arn Anderson lost the WCW Tag Titles to the Nasty Boys. - WCW BattleBowl (November 20, '93) = Roma & Erik Watts were beaten by Brian Knobbs & Johnny B. Badd. - WCW Starrcade '93 (December 27) = Pretty Wonderful (Roma & Paul Orndorff) won over Marcus Bagwell & Too Cold Scorpio. - WCW Clash of the Champions XXVI (January 27, '94) = Pretty Wonderful fell to Stars & Stripes. - WCW European Cup Tournament (March '94) = Roma lost in the first round to Vader. Sting won the tournament. - WCW Bash At The Beach '94 (July 17) = Pretty Wonderful won the WCW Tag straps from Cactus Jack & Kevin Sullivan. - WCW Fall Brawl '94 (September 18) = Pretty Wonderful stayed the WCW Tag Champs, beating Stars & Stripes. - WCW Halloween Havoc '94 (October 23) = Pretty Wonderful regained the WCW Tag-Team Titles from Stars & Stripes. - WCW Clash of the Champions XXIX (November 16, '94) = Pretty Wonderful dropped the WCW Tag Titles to Stars & Stripes. - WCW SuperBrawl V (February 19, '95) = Roma was pinned by Alex Wright.